Catch Paul Dorpat and Jean Sherrard — photo-history presentation on their new book, Seattle Now and Then: The Historic Hundred, on Sunday, November 25, at 2:00 p.m. at the Fremont Branch Library, 731 N. 35th Street. Free! Refreshments! 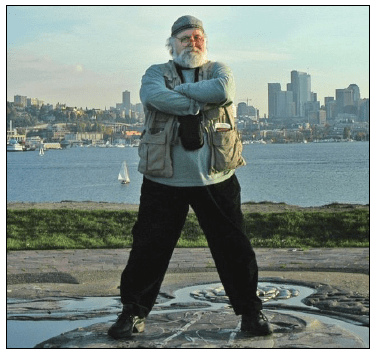 Drawn from the Seattle Now and Then columns in the Seattle Times, numbering 1,800 written over 36 years, the hard cover, 12″ x 9″ coffee-table book includes 240 pages (and a four-page foldout gatefold) of “Then” photographs, articles, and all new color “Now” photographs. Copies of the book will be available for sale and the authors will be available to personally inscribe them. The Fremont Library writes: “Paul Dorpat and Jean Sherrard’s new coffee-table book showcases the most compelling and essential of the more than 1,800 “Seattle Now & Then” photo-history columns that Dorpat has produced for the Sunday magazine of “The Seattle Times” for more than 36 years, since January 1982. “The book covers views from all directions throughout Seattle, highlighting its native roots and earliest days as a city (and its earliest photographs), and includes a special, four-foot-wide gatefold that reveals the city’s massive growth from the prospect of Queen Anne Hill. “Dramatic images comparing ‘then’ to ‘now’ explore the city’s regrades, bridges, thoroughfares and countless Seattle landmarks. The Great Seattle Fire, the Gold Rush, Pike Place Market, the 1909 Alaska-Yukon-Pacific Exposition and the 1962 Seattle World’s Fair get attention, as do breathtaking panoramas, all in a size and clarity rarely seen. The presentation will be in the community meeting room on the lower level. The room can be reached using both indoor and outdoor stairways. It is also accessible using a paved pathway that meanders down the slope from N. 35th St. to an exterior door. The library is open from 1:00 p.m. to 5:00 p.m. on Sundays. Info: 206-684-4084. Presented in partnership with the Fremont Historical Society and Queen Anne Historical Society. Books available for purchase from Globe Books. The event is free and light refreshments will be served.